The brash bawling of Noddy Holder has led Slade to more triumphs than a team of David Bedfords. And Saturday's volcanic eruption at Bridlington Spa Ballroom was no exception. It was a stormer, proving beyond doubt that Slade have reached the all important step where they no longer have to be as good as their next single. Their stamping, crashing riotous stage act is one for the kids who want to stamp and crash as well. No-one sits and listens. Like an unruly football mob behind the goalmouth their fans chant and wave scarves. It's not beyond the realms of impossibility that these fans would cause more than just a spot of bovver if fans of a rival group were to turn up. But fortunately there are no rivals here, Slade have this scene all to themselves. With so many one-nighters behind them, their act is now perfect from start to finish. It's perfectly simple stuff - a mixture of 12-bar, their recent hit singles and material from the "Slade Alive" album - and they put it across with what appears to be a maximum of effort. Guitarist Dave Hill and bass player Jim Lea leap onto conveniently placed tables and boxes throughout the set while Holder gets on his knees for Janis Joplin's "Move Over Baby". His amazing voice is always the root for whipping up the excitement. "Hands up all the girls with white knickers on", he yells to the crowd. A few hands are raised and the shrieks come forth. "Hands up all the girls with no knickers on". And uproar breaks out. "We've heard there's a lot of very rude girls in Bridlington. Is that right?" 3000 voices male and female acquiesce in unison and the crowd force themselves tighter against the stage, reaching out to touch the boots of their heroes. Few other groups could get away with such basic stuff, but it suits Slade to a tee. Like many before them, they've realised that success comes with keeping things simple. And using that formula they've found a style of their own based largely on the similarity in the sound between the bass and the drum pedals and the boot heels crashed crashed onto a ballroom floor. Drummer Don Powell 's contribution to the overall sound cannot be underestimated. As the act wore on, the fans became indifferent to what was being played. 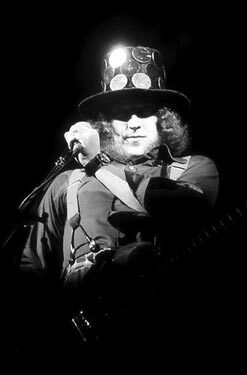 So long as Slade were up there they were having a good time and nothing else seemed to matter - there were even a few screams during Slade's rendering of John Sebastian's, "Darling Be Home Soon". Especially as Holder, somewhat inevitably suggested that blokes have a "good feel with the birds" during this comparatively slow number. Basic they may be, but they're very good at it. Many other groups with similar formula have tried and failed but Slade's patience and ability have brought them through the rank and file to the front. On this showing they'll stay there a long time.